Home / jinn / Can a Man Marry a Jinni Female? 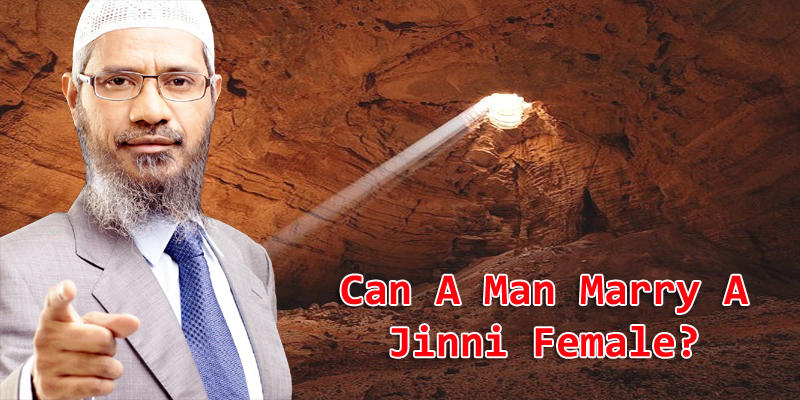 Can a Man Marry a Jinni Female? The question of whether a human may marry a jinni is a controversial one. There is no evidence from the Shari`ah that can be said to be authentic in that regard. The majority of jurists are of the opinion that such a marriage is not lawful, but some jurists consider it to be lawful. The first opinion is the more correct to follow. He Almighty also says: ''O people! be careful of (your duty to) your Lord, Who created you from a single being and created its mate of the same (kind) and spread from these two, many men and women; and be careful of (your duty to) Allah, by Whom you demand one of another (your rights), and (to) the ties of relationship; surely Allah ever watches over you" (An-Nisaa': 1). Besides, there would be no offspring if a human and a jinni were to marry each other. According to Mughni Al-Muhtaj by Al-Khateeb Asherbini, a Shafi`e scholar, there are two kinds of prohibitions to marriage: perpetual and non-perpetual. Of the perpetual prohibitions is marriage between humans and jinn; it is not lawful for a member of human kind to marry a jinni. Allah Almighty says: ''O people! be careful of (your duty to) your Lord, Who created you from a single being and created its mate of the same (kind)" (An-Nisaa': 1). He Almighty also says: "It is He Who created you from a single person, and made his mate of like nature." (Al-A`raf: 189). According to Rad Al-Mehtar `ala Ad-Dur Al-Mukhtarby Ibn `Abdein, a Hanifi scholar, the jurists define marriage as “a contract that makes it lawful for a man to make love to a woman without there being a lawful prohibition to this marriage.” A lawful prohibition here refers to marriage to another man or to a hermaphrodite, a polytheist woman, a closely related woman, or a female jinn. Contemplating the verses ''Marry women of your choice" (An-Nisaa’: 3) and"And Allah has made wives for you from among yourselves" (An-Nahl: 72), one can realize that it is only women of human kind that are lawful for men to marry. In addition, a jinn male may take the form of a female and vise versa. Also according to Al-Ashbah, a book on juristic rules by Ibn Nujaym, marriage between a human and a jinni is not lawful, for they are of different worlds. It was said that Al-Hassan Al-Basri was of the opinion that such a marriage is lawful so long as there are witnesses to it. But it was also reported that he did not believe it is lawful. Any way, the more correct opinion to follow in this regard is that it is not lawful for a human being to marry a jinni, for they are of different worlds. It is not lawful that members of human kind marry members of jinn kind. This is inferred from the following verses: 'And Allah has made wives for you from among yourselves' (An-Nahl: 72) and 'And among His Signs is this, that He created for you mates from among yourselves' (Ar-Rum: 21). The exegetes say about these verses that the words from among yourselves in both verses refer to human kind; they may be paraphrased from your own kind or from your own nature. These verses are analogous to the verse “Now hath come unto you a Messenger from amongst yourselves” (At-Tawbah: 128), for from amongst yourselves here refers also to human kind. Besides, Allah Almighty refers in His Book to the women who are lawful for men to marry: “O Prophet! We have made lawful to thee thy wives to whom thou hast paid their dowers; and those whom thy right hand possesses out of the prisoners of war whom Allah has assigned to thee; and daughters of thy paternal uncles and aunts, and daughters of thy maternal uncles and aunts” (Al-Ahzab: 50). [What was applied to the Prophet (peace and blessings be upon him) according to this verse is also applied to Muslim men in general.] Mind that it is juristically known that this verse also indicates that single women who are not related to one may also be marriageable to one. Al-Kermani reported in his Masa’il that there was a hadith reported to the effect that the Prophet (peace and blessings be upon him) forbade marriage from the jinn. Second, the aims of marriage are to find tranquility, peace, and compassion with a partner close to one. All this would be lacking with jinn partners, for hatred for human kind is innate in their nature. Third, there is nothing in the Shari`ah to the effect that it is permitted to marry members of the jinn. Allah Almighty says: “Marry women of your choice” (An-Nisaa’: 3). It is known that women refers to female members of human kind. This indicates that it is unlawful to marry other than women. Fourth, it is not principally permitted for a free man to marry a slave woman, in order that they not may bring forth a slave child, which is not in the interest of the child. By comparison, marrying a female jinn may result in bringing forth a child having jinn characteristics, which is far worse than slavery. Hence, so long as it is not permitted for a free man to marry a slave woman, though both belong to the same kind (human kind), it is with greater reason not to permit marriage to jinn, for they are of different nature. By analogy, we also find that it is prohibited to cross donkeys and horses, for this results in a hybrid different from horses, and this may, in turn, lead to the rarity of horses. The Prophet (peace and blessings be upon him) commented on those who do so by saying, “Those who do so are ignorant.” If so is the case with animals, it is with greater reason that it also be the case with marriage between humans and jinns. In his book Akam Al-Murjan, Ash-Shabli, a Hanifi scholar, stated: Scholars are of two opinions regarding marriage between humans and jinn. One says it is unlawful and the other says it is lawful. The first view was adopted by a group of Hanbali scholars and was also reported in As-Seraji Fatwas. They cited as evidence in this respect Almighty Allah's words "And Allah has made wives for you from among yourselves" (An-Nahl: 72) and "And among His Signs is this, that He created for you mates from among yourselves, that ye may dwell in tranquility with them, and He has put love and mercy between your (hearts): verily in that are Signs for those who reflect" (Ar-Rum: 21). They also cited as evidence in this regard a hadith to the effect that the Prophet (peace and blessings be upon him) prohibited marriage to jinns. The second point of view in this regard was reported to have been adopted by Al-Hasan Al-Basri, Qatadah, and others.